Day 01 Arrive Paro International Airport. During the journey to Paro, one will experience breath taking view of Mount Everest, Kanchenjunga and other famous Himalayan peaks, including the sacred Chomolhari and Mount Jichu Drake in Bhutan. Overnight at hotel. Day 02 Breakfast is followed by a visit to the Rinchen Pong Dzong. This massive fortress is located on a small hill just above the Paro River (Pachu) in the Paro valley. You have to walk about 15 minutes by crossing an ancient wooden bridge with shingle roof built in typical Bhutanese architect. Lunch in the Hotel. After lunch, visit the National Museum (Ta-Dzong). Dinner and overnight at hotel. Day 03 Drive from Paro to Thimphu, about 2 hours. Thimphu is the capitol of Bhutan. Check in at Hotel. Refresh with lunch and admire Bhutanese art throughout your hotel. A visit to the bank and post office to exchange money and an opportunity to purchase collector Bhutanese stamps, exquisite! Tonight we enjoy dinner hosted by Soenam of Rainbow Tours and Treks. Day 04 Drive from Thimphu to Talekha. The trek starts from Simtokha Dzong where the ponies, camp gear and our cook will be waiting. Pack up the horses. Your trek includes the finest of high altitude tents and warm sleeping bags. You only have to carry a small pack for your daily needs. Water of course is provided. The Talekha village consists of five houses and a huge temple called Tale-Lhakhang. Overnight at Talekha campsite. Day 05 Talekha to Japhuna. The trek leads you through thick forests of blue pine and evergreen oak trees into soft pine and spruce forests for about two and one-half hours. For lunch we halt at a yak camp site. Here the tree line ends. After lunch you cross a pass called Jelezela, Altitude at 13,000 ft. From the pass, one can enjoy a breathtaking view of Thimphu valley and its surrounding mountain ridges. After crossing two ridges, you arrive at the second campsite, Japhuna. Day 06 Japhuna to Jaduna. The trail from Japhuna takes you up and down over several ridges for about four hours till you come across a small stream where you will find two trails which will lead you to the same destination. Along the route, there are many small lakes. After another hour and a half climb through rhododendron shrubs, you reach the third campsite which is also a yak camp. Altitude 13, 200 ft.
Day 07 Jaduna to Labatama. 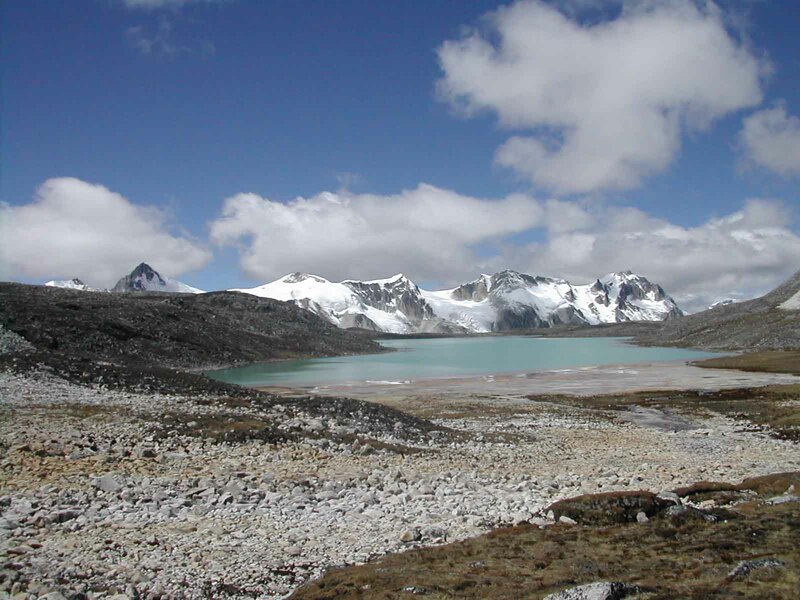 There are two trails, one going on the left side of Aum Jomo ( highest peak in the Dagala range ), and the other onto the right side of Aum Jomo over the Jomigue pass and Setso Yumtso lakes. We follow the trail that goes on the right side of Aum Jomo and climb up to the Jomigue pass after passing the Dungka Tso lake. From the pass, you can see beautiful views of the high mountains towards the northern Bhutan. After the pass, you descend for about 2 hours to reach Labatama yak camp by the side of the Yumtso lake, where you camp for the night. Day 08 Labatama ( halt ). You can visit several lakes and enjoy a good fishing day in the lakes or go back to Jomigue pass and climb Aum Jomo to the summit, at 16,500 ft. This trek will take about 5-6 hrs. Overnight and relax at campfire. Bhutanese song, gourmet food, and local brew – ARA anyone! Day 09 Labatama to Genekha: Today, you leave the lovely pasture of Labana and move out of Dagala range. The trail ascends gradually through beautiful landscape until you reach Pagalaptsa pass at 13,600 ft. This is the highest point of the day. From the pass, you have beautiful views of the Genekha village and a portion of the Paro valley. After the pass, you gradually climb down through thick Rhododendron shrubs and thick oak forest till you reach Genekha. Overnight camp in Genekha. Day 10 Genekha to Paro. A short walk will bring you to the motor road where your transport will be waiting. Drive about one hour to Paro. Enjoy hot stone bath at local farmhouse and sumptous dinner at hotel. Refresh yourself. Day 11 Today you may take a day excursion to Taktsang Monstery. Horses can be provided, up to Taktsang Monastery. The name Taktsang means ” Tiger’s Nest “. The Monastery is perched on a rocky ledge with a sheer drop of nearly 4,000 ft. and overlooks the Paro river and the valley. The Monastery itself was built in 1684 AD. Picnic lunch at the Taktsang cafeteria. The round trip hike takes about 4 hrs. Farewell dinner and overnight hotel. Day 12 Breakfast and depart for Paro International Airport. We hope you have enjoyed your DAGALA THOUSAND LAKES TREK.